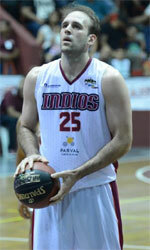 San Martin Corrientes (La Liga) landed 27-year old American center Travis Elliott (203-104kg-91, college: Beth.-Cookman). He started the season at Petrolero in the La Liga Argentina. In 19 games he averaged 7.4ppg, 6.3rpg and 1.0apg this season. The most of last summer Elliott spent at Aguilas (LPB) in Panamanian league where in 15 games he had 7.3ppg, 8.3rpg and 1.1apg. He also played for Mekong United (TBL) in Thailand league. In four games he recorded just 2.3ppg and 4.5rpg. Among other achievements Elliott received Latinbasket.com All-El Salvador Liga Mayor Center of the Year award back in 2016. And here thanks to pro basketball he experienced life on three different continents. He is familiar with Asian, Latin American and of course North American leagues. Elliott has played previously professionally in Bahrain, Canada (The Storm and London Lightning) and El Salvador (Halcones and Brujos Izalco). He attended Bethune-Cookman University until 2015 and it is his fourth season in pro basketball.